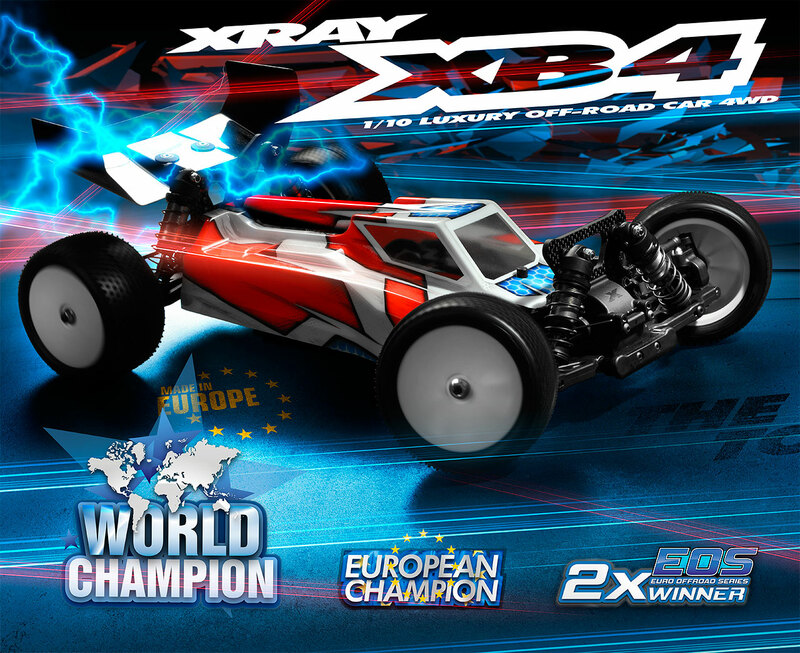 XRAY raised the bar in the 1/10 buggy class with the XB4, bringing a new high-quality, high-performance player to the field for all others to measure themselves against. 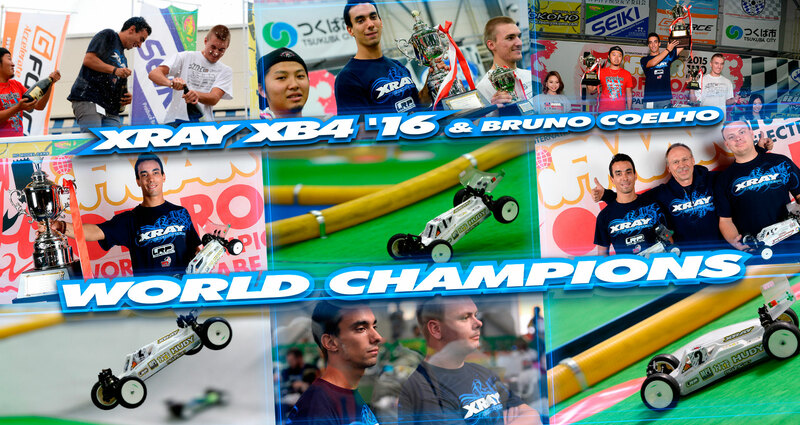 Now with a more adaptive platform, XRAY’s 1/10 buggy… the new XB4’16… is now even more the beast to beat. The new XB4 is artistically crafted in our in-house XRAY factory by design & production specialists, and then extensively tested and refined by the world's best drivers. Designed, developed, and fully manufactured in Slovakia, Europe, with XRAY's legendary attention to detail, fine materials, and extreme performance, I am excited to present to you the all-new XB4. Development of the XB4 platform continues as we move into future, fueled by our fundamental belief in precision design and a desire to bring forth only the best products and world-class support. Race results from XB4 drivers around the world – including the European Champion title and dozens of national titles worldwide – prove we are on the right track. The XB4 is a typical XRAY car – a premium, professional, high competition model racing car for the most demanding racers, developed and designed with attention to the smallest details. Manufactured from premium European materials, machined using state of the art Swiss and German machines and backed by premium service & support, the XB4 is a typical XRAY, a luxury masterpiece. The 2016 chassis is an all-new shortened design, with better weight balance and more in-front motor position, optimized design for short-pack battery only, and extra central diff mounting holes for further weight-balance adjustment. CNC-machined from high-quality Swiss 2mm 7075 T6 aluminum, the chassis is strategically machined in low-stress areas to make it as light as possible without affecting strength or rigidity. For increased lifespan, the chassis is black coated at XRAY’s own in-house fully robotic operated coating line. Redesigned side guards accommodate the new chassis design. Moulded from a hard composite material, the side guards make the chassis frame flex suitable for the majority of track conditions. For very-low-traction tracks, optional medium stiffness side guards are available. The tough composite side guards perfectly fit the chassis to seal against dirt and protect from side impacts. Front & rear bulkheads were strongly reinforced in numerous areas to withstand rigorous impacts and abusive racing conditions. The diameter of the holes for ball-bearings were refined to minimize ball-bearing play, resulting in increased gear teeth lifespan and minimized gear stripping. XRAY’s attention to the small details, R&D and engineering are obvious in the design of the diff bulkheads. These unique bulkheads allow super-fast and easy diff exchange and servicing by dismounting only 4 screws from the front of the bulkhead and bottom of the chassis. This super-fast diff access is available in both front and rear. Multi-Flex of the XB4 is all-new and redesigned. To allow for easier flex adjustment and a wider and more optimized adjustment, gone are the long top decks which are replaced by independent upper decks; flex adjustment was transferred into the composite chassis braces and side guards. XRAY Multi-Flex Technology™ has resulted in some of the most significant milestones in RC model car development in the last decade. This innovation has proven to be a distinct competitive advantage at tracks worldwide, helping XRAY cars dominate races at local and national levels. The XB4 is the world’s first 1/10 off-road chassis incorporating Multi-Flex™ adjustment technology, allowing drivers to tune chassis flex for different track conditions. Whether the track is low, medium, or super-high traction, you can easily adjust the chassis flex to suit track conditions in a matter of seconds. It has never been so easy to professionally & predictably set up flex… another smart innovation by XRAY. Long top decks are no more. The XB4 features separate front, central and rear upper decks which are independent from chassis flex adjustment and work only as part of the front, central, and rear diff assemblies. In line with the all-new Multi Flex™ design, composite chassis braces replace the long upper top decks and are mounted directly to the chassis to fine-tune chassis flex adjustment. Adding or removing screws from the bottom of the chassis braces adjusts the chassis flex. The front chassis brace includes a graphite stiffener which is additionally mounted to the composite brace to hold the electronic cables… and which is also part of the chassis flex adjustment. A rear graphite stiffener is available as an option. To accommodate the new Multi-Flex™ and upper deck design, the motor mount was redesigned as well. To allow adjustment of the weight balance, the motor mount can be easily installed frontwards or rearwards. The graphite central upper deck holds ball-bearings in the motor mount and bulkhead assembly, while the upper deck allows easy access for slipper clutch adjustment. With the new weight-balance adjustment feature based on the motor mount position, the central bulkhead can also be mounted either frontwards or rearwards. Power from the motor is transferred to the drivetrain via an adjustable central slipper clutch for quick & easy tuning. The all-new improved 3-pad slipper clutch ensures smoother clutch operation and more efficient braking, and clutch adjustment is easier, more consistent, and ultra-fine. The lightweight slipper clutch plates have a machined relief which decreases the friction surface to assist with clutch slip adjustment. With this plate design, pressure is on the circumference of the clutch pads for increased efficiency. The clutch outdrives are super lightweight and manufactured from HUDY Spring Steel™ and then additionally hardened for extra lifespan and reliability. The slipper plates are machined from premium Swiss 7075 T6 and additionally hardened then given a black final surface treatment. With the new redesigned chassis and weight balance adjustment, the central drive shafts were redesigned in length. Depending on the motor position, the center diff block moves as well and appropriate length central drive shafts must be chosen. The XB4 constant velocity drives (CVDs) are manufactured from world-renowned HUDY Spring Steel™. The drive shafts are some of the world‘s thinnest yet most durable drive shafts used in electric off-road cars. Hardened with a proprietary hardening process, the drive shafts provide unbeatable lifetime and reliability. Both front & rear lower arms are new in the XB4. The front arms are narrower which allow them to be moved frontwards and rearwards to adjust weight balance. With the new design of the front arms, the weight of the car is moved more towards the center of the car. The rear arms feature a more reinforced design to better withstand crashes. Both front & rear arms have new more optimized shock position mounting holes which are suitable for all track conditions. Suspension arms are one of the most important parts of any RC model car, as they directly influence the handling characteristics of the car. The XB4 suspension arms are the result of long-term tests of different designs and layouts. Length, thickness, flexibility, geometry, and materials used… these are all part of the concepts & details that are thoroughly reviewed to create optimum suspension arms. The exclusive composite mixture used for suspension arms is a perfect balance between reliability and performance. The suspension arm itself is rigid enough to provide a responsive feel, yet soft enough for extreme durability. Uprights were redesigned with new lower roll center position which moves the uprights more outside of the car for increased stability. The upper roll center adjustment has 3 different positions. The rear uprights feature 0° toe to ensure stability and prevent suspension geometry changes in hard crashes. The very compact uprights are small in size but very strong due to the special composite mixture used. For maximum drivetrain reliability, larger 5x12 ball-bearings are used in the outer position for increased dynamic load. On the inner position, the smaller 5x10 ball-bearings are used to minimize unsprung weight. The outer suspension pin on which the rear upright sits features shims for additional wheelbase adjustment. Shock towers were redesigned to accommodate the new reinforced bulkheads. These new shock towers feature new more optimized shock positions which correspond to new upper arm shock positions. Both front & rear shock towers are machined from premium-grade graphite, are lightweight and strong, and have multiple shock positions as well as multiple roll center adjustment positions. The rear shock tower holds the wing mount. With the new weight balance adjustment, the new XB4 features two different battery straps: short -or- long. Using the new longer battery strap, the battery pack can be installed either frontwards or rearwards; included foam back spacer ensure the battery pack will not fall out. The new front body post is shorter to fit the new front upper deck and body. The all-new XB4 body features high-downforce areas (including front window and top roof flow channels) for proper air flow, and side downforce areas and top central rib for higher stability. The high-performance, low-profile aerodynamic body was designed by XRAY to perfectly fit the XB4 and work in most track conditions. The body is made from high-quality premium Lexan™ material. For very-high-traction track conditions, an optional ultra-lightweight body is available that will reduce the roll of the car and improve rotation of the car in corners. With the all-new design you can easily adjust the weight balance. You can move the motor frontwards and rearwards, and you can do this independently of the short battery pack that can be moved frontwards and rearwards as well. XB4 constant velocity drives (CVDs) are manufactured from world-renowned HUDY Spring Steel™. The drive shafts are some of the world‘s thinnest yet most durable drive shafts used in electric off-road cars. The CVD assembly also features a composite safety collar to keep the mounting pin solidly in place. The super-smooth gear diff includes a composite case and cover with integrated crown gear. The internal gears are precision-molded from tough XRAY developed and mixed composite material ensuring high life time and super-smooth and efficient operation. The maintenance-free diff design is a feature that will benefit racers of all levels. When the diff is correctly built, there is no need for maintenance for a very long time… no need for frequent oil changes, and no leakage due to our superior sealing system. Both front & rear diff crown gears and pinion gears are made from steel which has been additionally hardened to ensure increased lifespan and reliability. The width of the crown gear teeth is narrower to allow the gear to be as light as possible. The width of the pinion gear teeth is wider to allow it to work also with optional composite and aluminum crown gears. For clay and low-traction tracks, optional graphite diff crown gears can be used to increase traction. The optional ball differential was designed and is suggested for low traction track conditions. Externally adjustable ball differential is machined from HUDY Spring Steel™ and additionally hardened for extra durability and long lifetime. High-quality carbide thrustbearing is included for smooth operation and the carbide balls ensure ultra-smooth running. The ball differential comes factory pre-assembled. The super-smooth gear diff includes a composite case and cover with exchangeable spur gear. The gear diff set includes 81T spur gear and a range of various spur gears is available as an option. The XB4 is equipped with an 81T spur gear which suits the majority of tracks. For additional tuning, optional 75T, 78T, and 84T spur gears are available. Over the years, XRAY has successfully gained and utilized extensive knowledge of suspension geometry and stiffness, which has been applied while designing suspension parts. The ultra-lightweight suspension parts are molded from a special composite material to make the parts very light yet very durable to withstand the rigors of high-performance racing. The front and rear arms feature double shock mounting positions and integrated anti-roll bar mounts. A complete set of eccentric bushings is included for complete suspension geometry adjustment. The bushings are inserted into aluminum holders which are machined from premium Swiss 7075 T6. Suspension arms allow for quick & easy wheelbase adjustment. Using included 2mm shims, both front and rear suspension arms can be moved either forward or rearward to adjust weight balance depending on track conditions. By moving the arms to the front, the balance and weight of the car are transferred more to the rear; this is recommended for medium- and high-traction conditions. By moving the arms to the rear, the balance and weight of the car are transferred more to the front. The wheelbase shims allow not only forward/rearward suspension positioning, but also allow the wheelbase to be adjusted shorter or longer to fine-tune set-up for various track conditions. The 1-piece caster blocks are very lightweight, yet the construction of the caster blocks makes them very stiff and rigid. The non-adjustable caster angle is preset for 9°. The roll center position can be easily and quickly adjusted by inserting different thickness of shims on the top of the caster block between the block and the vertical ball stud. The caster blocks feature large openings for quick & easy assembly/disassembly of the CVDs. The entire CVD assembly can be easily inserted/removed through the C-hub without the need for disassembly. The large openings also prevent collision of the CVD with the C-hub in serious crashes. The front of the chassis is pre-angled with an integrated 8° caster angle, however the position of the adjustable eccentric bushings in the I.S.S. suspension holders influence the caster as well. (For example, if the eccentric bushings have the roll center in middle position, the caster angle is 9° and with the 9° in caster block the overall caster angle is 18° of caster. Optional caster blocks with 6° and 12° caster angles are available for further suspension geometry adjustment. Ultra-lightweight 14mm wheel hex drive hubs are CNC-machined from Swiss 7075 T6 black-coated aluminum. These ultra-true hex hubs have a clamping design which ensures ultra- solid mounting of the wheel on the hub. To adjust the track-width, optional offsets are available. Well-built, reliable shock absorbers are extremely important for super-smooth suspension action on every type of track. The shocks on the XB4 have been specifically designed to be built easily, perform consistently, and last reliably. Attention was paid to all the smallest details during the design process, as well as during the long-term testing in various conditions and track types. The big-bore shocks are membrane free, but still allow for easy, consistent building and rebound setting using the bleed-screw shock cap design. The up-stop travel of shock rod is adjusted via rubber O-rings, while the downstop is adjusted using composite shims under the pistons. The pistons are made from Delrin® and are molded using super-precise moulds. There are several types of pistons included with different holes and diameters for precise shock adjustments. For custom adjustment, a set of blank non-drilled pistons are also included. The shock rods are machined from special steel material, precision hand-ground for maximum smooth operation and additionally hardened for increased lifespan. The XB4 springs have been specifically designed to complement the big-bore shocks. The XB4 springs, like all other XRAY springs, are manually measured, selected, and matched into pairs to guarantee precisely equal length and damping characteristics. Each of the springs is laser engraved with stripes to indicate the firmness of the spring; the more strips, the harder the spring. The new design of the rear suspension arm allows very practical variable position of the rear shock absorbers. Depending on track conditions, the rear shock absorbers can be installed either in front or behind the shock tower. XRAY Premium Silicone Oils are manufactured in Europe by a specialized premium silicone oil manufacturer; these new oils were exclusively created for XRAY. Each batch of premium oil is laboratory tested and calibrated to ensure the highest possible consistency and quality from one batch to the next. Based on the industry-standard cSt rating, the new line of oils will be easy to identify, adjust, and feel. A full set of 22 high-speed, blue-sealed ball-bearings are used throughout the drivetrain to ensure maximum efficiency. All of the bearings are degreased and oiled with Aero Shell® Fluid 12 for maximum smoothness and long life. The new specially-designed XB4 wheels are perfect for high-competition racing. The wheels are made from a very flexible material, while still being durable to withstand impacts. The side of the wheel is aerodynamic for maximum performance. The special features of the wheel are visible from the inside – the reinforcement ribs are designed to make the wheels as stable as possible and eliminate deformation. The front wheels feature +1mm offset which makes the front of the car wider and therefore more stable. The XB4 includes premium HUDY Graphite Grease which is a high-performance, advanced-technology semi-fluid lubricant which incorporates both extreme pressure additives and finely-dispersed graphite for load carrying. It is intended primarily for the lubrication of rotating parts and loaded gears. In addition to providing outstanding load carrying, it is formulated to have excellent adhesion and resistance to "fling-off" under extreme conditions. The grease reduces wear and increases parts life.